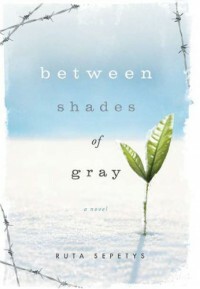 With all the turmoil occuring in Russia and surrounding areas, I thought it might be a good idea to read “Between Shades of Gray.” I was absolutely floored to realize Stalin created the same atrocious acts Hilter committed. I’m glad I know now though and will be sure to share my knowledge with others. It’s scary how such a horrible part of our world’s history can be overlooked. I raced through this book and feel as though I learned quite a bit of history. It's always heartrending to realize there were people who actually went through similar instances depicted in this book. History has an unforgiving brutality to it at times. I found the flashbacks a tad bit annoying, but they divulged some useful information that wouldn't have necessarily been revealed otherwise. *The scene where their father gives them his wedding band and tells them to let their mother know it's okay to sell it if she needs the money broke my heart. *The men were so brave! Their defiant singing of the Lithuanian national anthem as they were separated from their families brought tears to my eyes. *When Lina and her mother were nearly buried alive in a hole they had just finished digging I couldn't help but shudder. *It was truly agonizing when the American ship arrived at Trofimovsk. To have salvation so close at hand and yet denied would be an awful torment. Overall, an amazing story that shares a forgotten piece of history.